CALL TODAY FOR A FREE QUOTE AT 916.333.3271 or click here. He really hopes he doesn’t have to do all this laundry. That just happens to be one of those crazy thoughts that crossed my mind to break up the monotonous task of folding shirts coming off of the curing/dryer conveyor belt. It’s not a thought that’s going to cure any diseases or change the world. T-shirts – and how many can one person wear. You know, priorities. Thanks to a little Google research, and some time to put together a blog entry. We now know. 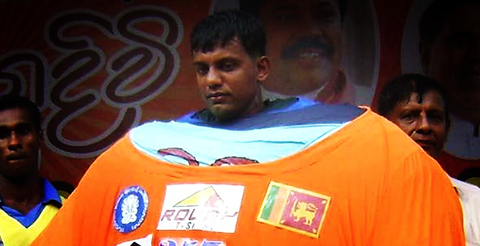 The Guinness Book of World Records recognizes Sandara Bandara, of Colombo, Sri Lanka as being the t-shirt record holder of the ‘most number of t-shirts worn at once’. In a large event hosted in his hometown of Colombo, Bandara achieved the World Record in front of thousands of spectators. 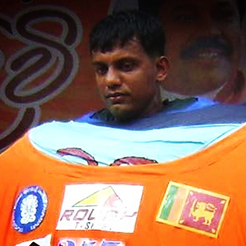 Bandara, a marathon runner and survivor of the 2008 Weliveriya bombing in Sri Lanka, took one hour, seven minutes, and three seconds to wear 257 (that’s right, two hundred fifty seven) t-shirts one over other. The feat has been attempted many times prior to Sandara setting the record, below is a list of previous attempts. That just takes “layering” to a whole new level. I suppose I should get back to work. We guarantee effective and knowledgeable printing services for you and your projects. We offer up to date technology and methods, equipment and materials to provide you with the best. Whether you need 12 items or 10,000, we can help you! We offer a standard 3-5 day production time on most services so you don't have to wait. If this is your first time working with us or first time since the last, we will work with you and answer all of your questions from beginning to end. We offer the best t-shirt brands available and carry the top names you know and trust like Hanes, Ogio, Nike, Fruit of the Loom and more. We only carry the top brands to maintain our customer satisfaction. If you have something you need printed, we'd love to hear from you. Fill out the quick form below and we'll be glad to quote your project for FREE!